The Patriotic Front (PF) are secretly recruiting teachers mostly recommended by the party structures disregarding the official list that was selected through the District Education Boards countrywide. See below accopy of the illegal recruitment letter that has been post dated to 11 the February 2019 but dispatched on the 27th of December last year. 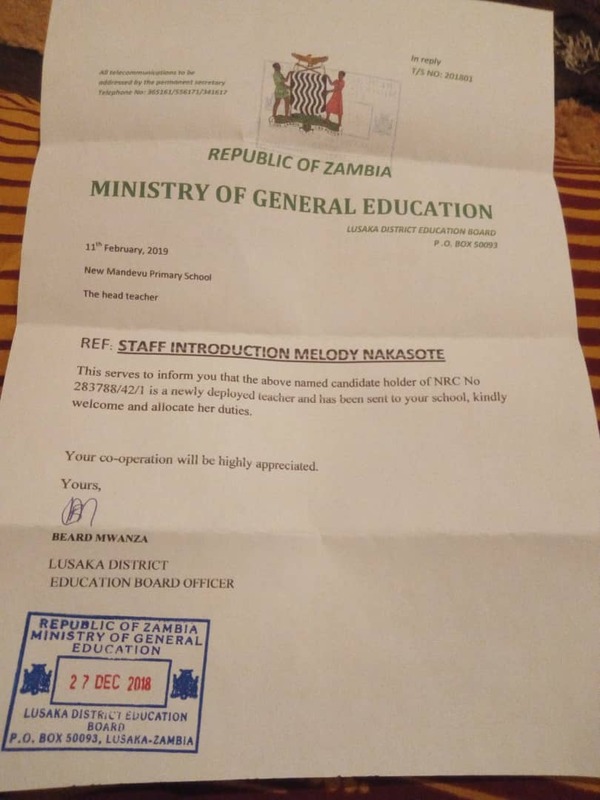 The Ministry of Education and the Teaching Service Commission, according to sources have been secretly issuing letters to the “party” cadres disadvantaging many deserving trained teachers. “You will recall that in December the Commission (Teaching Service Commission) made an announcement about the teacher recruitment. The list was even provided to the Zambia Daily Mail (a copy of which the Zambian Watchdog have) but it was withdrawn and they are now infusing their own names. ” It is unfortunate that it seems all systems have collapsed under the leadership of President Edgar Lungu. The TSC Chairperson Stanley Mhango has no knowledge of the teaching as he never worked as a teacher. See his he is now destroying the profession by recruiting PF cadres,” said the source. Meanwhile, sources have also hinted how Teaching Service Commission of Zambia Chairperson Mhango and the Executive at the National Union of Public and Private Educators (NUPPEZ) have been stealing money from unsuspecting teachers. We will publish the details of how the criminals at NUPPEZ are stealing in due courses here.